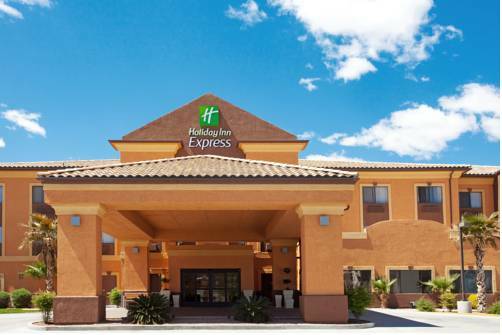 Kingman, AZ Hotel's Location Is the Gateway to the Grand Canyon Only 77 miles from the Grand Canyon Skywalk at the West Rim, our Holiday Inn Express Hotel & Suites Kingman is the perfect stopping place on your travels. Right off I-40 and historic Route 66, our hotel provides comfortable surroundings and a convenient location, whether you're on vacation or staying for business. We are 100 miles from Las Vegas' McCarran Airport and 37 miles from the Laughlin airport. Our hotel's corporate travelers in Kingman, AZ can rest easy knowing that we're situated a few minutes from businesses like Chrysler, BNSF, Tucson Electric and CTS. Our 625-sq-ft boardroom allows guests to host small, on-site meetings for up to 50 people and includes audio/visual equipment such as a television, DVD player and a projector. With quick access to Route 66, the hotel gives patrons the ability to easily travel to famous attractions like the Grand Canyon Caverns and the Hoover Dam, both about an hour away. If you'd rather stay closer to home, hike or picnic at Hualapai Mountain Park. When it comes to extra amenities like an indoor, heated pool, spa and a 24-hour Fitness Center, other hotels in Kingman, Arizona strive to meet our standards. The complimentary, hot Express Start Breakfast Bar and the free high-speed, wireless Internet access are just a few of the additional perks that we offer. Make your reservations today to enjoy our outstanding accommodations!